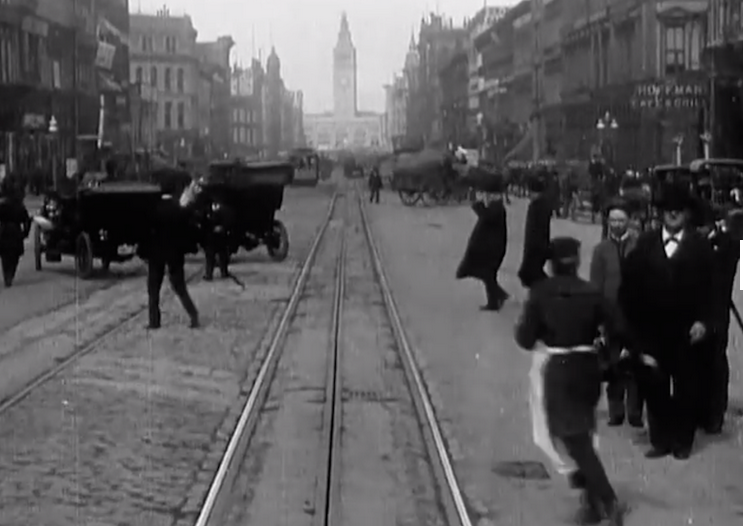 Vox had a great photo essay on how people used streets at the turn of the last century. It was an interesting follow up to their article on the history of jaywalking and further illustrated how the public street is now seen as primarily a thoroughfare for car traffic. Before cars were so ubiquitous, “city streets were once a bustling mix of pedestrians, streetcars, pushcart vendors, and children at play.” In other words, more like a city park. Here’s their photo of San Fransisco’s Market Street circa 1906. 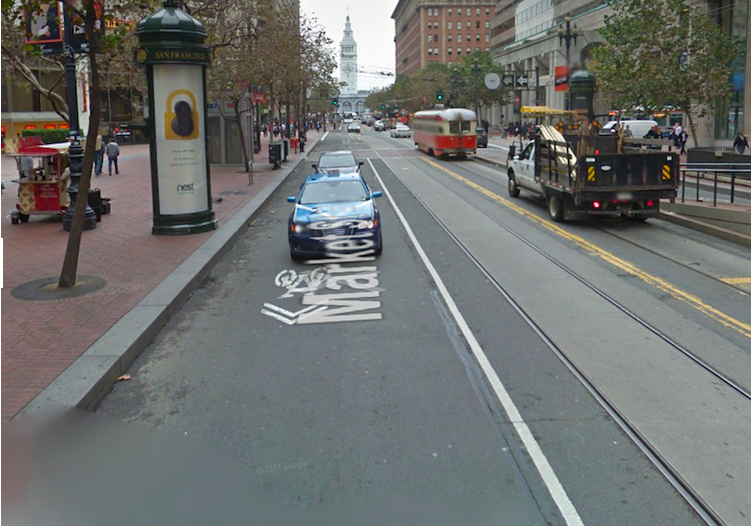 The difference is clear—what was once a street full of pedestrians is now fairly empty. But what really changed? The street today has wide, attractive sidewalks with decorative amenities and push cart vendors. Along with the cars, there’s public transportation and room for bikes. In contrast, the street of yesteryear has bike-busting cobblestones and hardly any sidewalks. If anything, the modern street is more protective of—and thus should be more welcoming to—pedestrians. As downtown planners, we tend to focus most of our efforts on things we can control and in an urban setting that means infrastructure and amenities. That’s clearly not enough though. If wide sidewalks won’t guarantee pedestrian traffic, maybe infrastructure isn’t the answer to everything. Maybe it’s more about how the nature of downtowns has changed—they’re used much differently now than they once were. Maybe it’s that our lives have changed and now that cars have become part of it, we’ve managed to create a world where it’s just not feasible for so many people to be on foot. Back in college when I was taking one of my first statistics classes, the professor told the story of the drunk who dropped his keys and was looking for them under a street light. He had dropped them in the alley but this was where the light was. It’s a nice reminder that the solution we want may not be the solutions we need. Perhaps it’s not just a physical solution but a social solution that’s needed. Instead of focusing solely on infrastructure (and believe me, I am in no way advocating we turn away from creating complete streets), maybe we should look to additional ways to address this problem. Granted, changing the culture is often a much harder hill to climb but I can’t help but think it would be a lasting change.